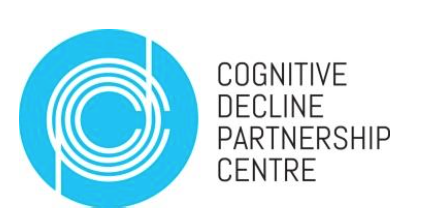 As co-chair of the Alzheimer’s Australia Consumer’s Dementia Research network, I presented at an Annual Meeting of the Cognitive Decline Partnership Centre (CDPC) this week on why it is important to include consumers in research, in particular people with dementia, as to date, most of the research has been done with care partners or the families of people with dementia. The slides I used for the presentation can be downloaded here Nothing about us without us. One of the things I have often found mildly disturbing at conferences and research forums, is that the research being proposed or in progress, seems to be more of a career statement, or career launching pad for academics, and I find it difficult to see how much of the research is of value, especially when people with dementia are still being told to give up our pre diagnosis lives, to get our advanced care planning and end of life things in order, and to get acquainted with aged care. Being Prescribed Disengagement ® at the time of diagnosis, which is then continued by the service providers and a lack of rehabilitative, disability or social pathway of support, makes no sense, and to me is not only unpalatable, it is unethical. I remain hopeful as by nature I am a positive person, but on many days, I do feel like giving up. This is not meant to be disrespectful to clinicians, service providers or researchers, especially as I hope to become one, but it is concerning when the research is about consumers which in this instance I mean people with dementia, and we are not included in the process or as participants. Hopefully Australia and other countries follow the excellent lead of the UK by setting up their own Join Dementia Research site. I squirm when people are called ‘clients’ or ‘consumers’ there bloody people for God’s sake not ‘the parkinson’s in room 4. I have and will always refer to people I care for by their name, we in aged care, talk about ‘person centred care’ I fail everyday to see this being delivered. With regard to your other point, research for career advancement, it is a disgrace to other professionals who do care and to the people they say they are trying to help. So much money is wasted on useless unfounded research just so that these people have another tick on their CV. Ask the people who are living with these diagnosis what it is that would make their lives easier, then maybe we would make a difference. Just a point I would like to make, not sure if you have visited this; the language being used in the health care sector is one that has negative connotations, this needs to be reversed, we all know words have power. clients… consumers… customers is the latest one… as long as we are INCLUDED, fully, I will learn to live with the term along the way! Every now and then, the road feels more long, and more hard…and discouraging words are more frequent. And when you are out there on the forefront, you are battered and buffered by more winds against you…and it can seem so much easier to turn around and let the winds carry you back. Then you have to dig deep, and pull from the well within you, to keep being and saying who you are called to be and what you are called to say. When it gets like that for me…I like listening to this video…it sort of restores me, and may it do the same for you. You are doing something, and on the forefront of something, that hasn’t happened yet in the world. You are breaking down barriers. You are creating space for more to happen. Of course it is going to seem overwhelming, especially when you look back at all the amazing things you have done. Kate, you are such an amazing inspiration. Great post Kate especially the cartoon. Totally agree Kate, the challenge relates to getting researchers and service providers to really value consumer involvement without the inherent stereotypes…. otherwise the involvement becomes tokenistic. Having been present at the same event the most interesting conversations I had was with people living with dementia talking about the best ways to facilitate their contribution. Starting today we are seeking someone living with dementia for the Steering Group for a new project!! Brilliant presentation BTW I really enjoyed it!! We are (arguably) so much more than monkeys, deserving of being participants in the research, not merely observed by others… the time is NOW! Is there a general site in Oz Kate? If not, what’s needed to set one up? V, Dennis & I are still involved in NeuRAFrontier’s work as clients, but everything else seems ad hoc. No there isn’t as far as I know Lynda… I’ve been advocating to AANO, the CDPC and the NHMRC for this for a while now, and will keep at it!